Extended dairy cow therapy reduces chance of costly double-whammy. Dairy cow mastitis costs nearly $200 per clinical case, according to the National Mastitis Council. You lose with decreased milk production, lower milk quality premiums, treatment expenses and increased culling. So you clearly want to avoid a relapse. Right? Dairy producers too often discontinue treatment once milk returns to "normal" and clinical signs of the infection subside. And, too often, that's not long enough. Now there's a way to cut relapse risk. Dr. Monty Belmer, large animal practitioner at the Waupun (Wis.) Veterinary Service, usually recommends an eight-day extended therapy protocol to completely cure mastitis the first time. WHO'S MISSING? When one cow drops out of your milking line-up due to a repeat mastitis attack, you lose money, big time. The veterinarian does bacterial culture on-farm, then treats based on culture results. High cure rates of environmental streptococcus are achievable, he says, particularly by extending first-time mastitis treatments to eight days. Nothing is more frustrating than having to re-treat a cow, affirms Dan Funke, quality milk manager for Pfizer Animal Health. So follow the course of treatment offering the best chance of a complete cure the first time. • Begin by working with your veterinarian to determine the appropriate mastitis therapy and treatment duration to eliminate the infection, not just its symptoms. That starts with identifying the pathogen. • Tailor treatments to the cow. Treatment protocols should be based on the cow's treatment history, type and length of infection, cow age and lactation stage. • An extended-therapy protocol, defined as administering intramammary treatment for two days to eight days, increases the likelihood of a complete cure, says Funke, particularly for hard-to-kill pathogens. Only two products on the market are labeled for and demonstrated effective for extended therapy. • Complete the prescribed treatment regimen to help ensure the infection is eliminated. Extended therapy can do so. It's the best thing you can do for the cow – and your bottom line. 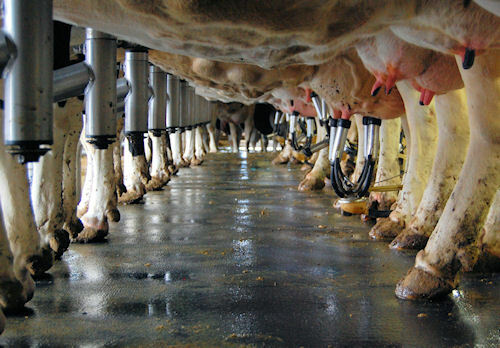 For more specifics and protocols on improving milk quality and cutting somatic cell counts, visit http://www.milkqualityfocus.com/pdf/Milk%20Quality_Lactating%20Brochure.pdf.